Smoked fish to be precise. I'm not a sweets person, though dark chocolate is nice, and I always have room for a really good macaron. But my favorite treat in the world is a great piece of smoked fish -- smoked salmon or trout or whitefish -- preferably with cream cheese on a piece of pumpernickel bread from Russ and Daughters in Manhattan. 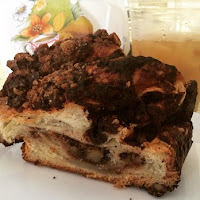 For desert, a piece of chocolate babka please, like the ones my mother-in-law used to get in Flatbush -- there's a close match available at Arcade Bakery in lower Manhattan. 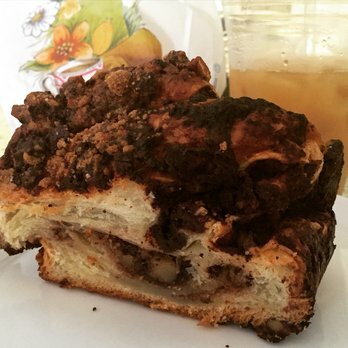 Find an insider's guide to NYC babkas: The Best Chocolate Babka in NYC, 2015 Edition. So what's your weakness? 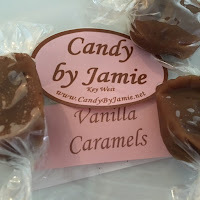 A creamy chocolate truffle? A glass of aged Zin? Icy fresh oysters? Seduce you with... what? SUSAN ELIA MACNEAL: Oooh, I liked smoked fish, too, Hallie -- whitefish salad or smoked salmon, especially on a good New York bagel. Also love pate. And olives. And good cheese with fruit. (I'd rather have a cheese plate at a restaurant than dessert....) And a nice glass of wine and the occasional martini. LUCY BURDETTE: Since I'm on a low-sodium, no alcohol diet right now (sigh), a lot of things look delicious! 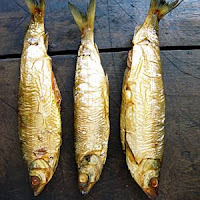 I love smoked trout, used to make an easy, elegant hors d'oeuvres by mixing dill and lemon zest into cream cheese, and then putting about a teaspoon of that on an endive leaf with a piece of smoked trout on top. Sadly, smoked trout packs 670 to 680 milligrams of sodium into a 2-ounce portion. Another favorite, hot pepper jelly cheese puffs. 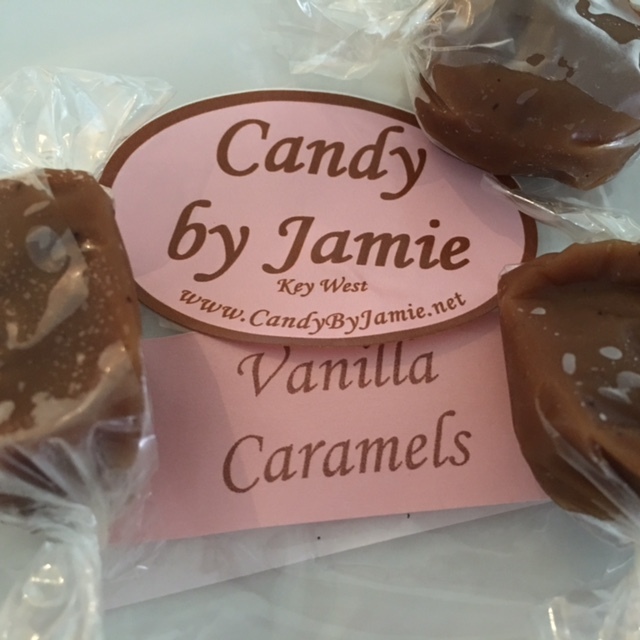 But I did make a delicious low-sodium almond cake for Easter, and found some yummy homemade caramels at the Key West Artisan Market yesterday. For now, that will make me happy:). RHYS BOWEN: If you want to seduce me offer me a spread of oysters, crab claws, cold lobster and a glass of prosecco and I'm yours. I'm also not big on sweets. I do love Creme brûlée , and Cadburys chocolate before it was bought by Hersheys. 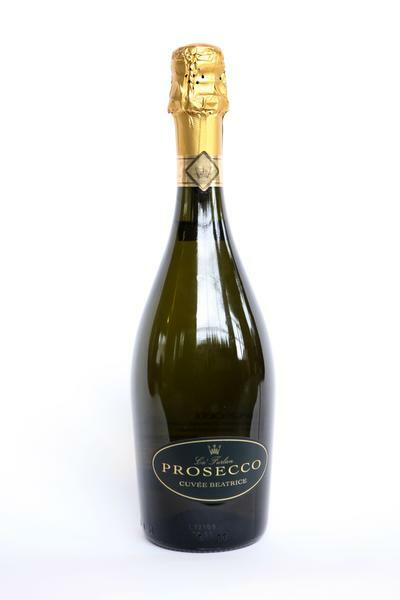 JULIA SPENCER-FLEMING: Add me to the Prosecco-lovers' list. For me, the seduction factor is the combination of food and place. 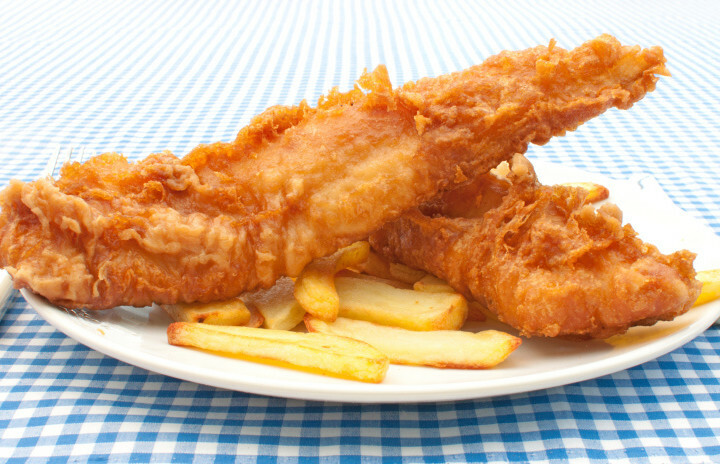 Fish and chips is a tasty meal anywhere, but batter-fried haddock and hand-cut fries sitting on the deck of a seafood joint on the Maine coast - that's heaven. Ditto a traditional ploughman's lunch with sharp cheddar, crusty bread, softened butter and pickle chutney served in a dark London pub with a half cider on the side. In New York City, it would be something cool and new in the Village, like Cuban-Carribbean fusion or authentic Korean, followed by a cab trip to midtown to catch a show. In the Bahamas, it would be conch, conch and more conch, served at a shady table planted in white sand, chased down by ridiculously fruity drinks. I love pate. 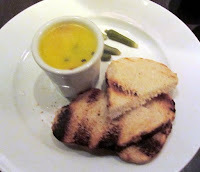 (I dream of chicken liver pate from Carluccio's in London). Love English sharp cheddar cheese and pickle (chutney) sandwiches. Oh! Oysters and Prosecco! Yum. Crisp white wines and maybe, very occasionally, a small glass of really, really good red wine. Maybe with a good French baguette and Stilton. Charcuterie, with salami and prosciutto and olives. HALLIE: It's very hard to put this blog to bed and go into my kitchen where I am making noodle pudding for dinner when now all I want is a dozen oysters, a glass of Prosecco, and an enormous white fish chub. Oysters, yum . . . macaroni and cheese, but only the made-from-scratch kind with lots of sharp cheddar cheese . . . dark chocolate . . . coffee . 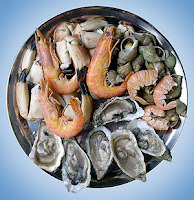 . . and count me in with the Prosecco folks, please . . . .
Smoked oysters (the only way I'll eat them). Really dark triple chocolate cake, but only a few bites. Fresh crusty sourdough bread with thickly spread butter (I have some dough on its final rise right now, so this is in my afternoon plans). A fresh local peach. A gold cherry tomato plucked sunwarmed from the vine. Good red wine, sliced ripe avocado, and interesting cheeses. Thanks for making me hungry! I'm surprised that there aren't more sweet eaters judging from the number of book covers I see with desserts on them, but I too could pass on sweets - except once in a while when I would kill for something sweet. Lobster like Rhys. I'd share that extra cheese pizza with Hank in a heartbeat. Sharp cheese, olives, lemons, and salty meat. I happen to love salad. Any and all of this with a bottle of Prosecco. Or even better, a martini with blue cheese olives. Hoping Lucy's loss of salt and alcohol is temporary, but if not, I know she'll master some great recipes without them. We have smoked trout in the freezer, and I had some for dinner the other night. So good, but as Roberta/Lucy said, full of sodium. My husband has a dynamite recipe for smoking fish and aside from the half bottle of soy sauce, it also includes a ton of other salt in the marinade. So freaking good, though. One of my daughters has a vacation home midway between Traverse City and Charlevoix, MI. There's a fishmonger in Charlevoix, John's, that sells whitefish and whitefish dip, made fresh daily from fresh-caught local fish. It's a red-letter day when they arrive with a cooler full of whitefish dip, and tart cherries. Cherry pie is one of the few not-dark-chocolate sweets that are worth swapping calories for. Sweet cherries, too. I've only recently gotten into oysters, as several Cincinnati restaurants now have daily fresh choices, and one group of GNO friends love them. I'm sold. Blue cheese olives? Where have they been all my life? Edith, I want some of that bread. Oooohhh, cherry pie. And blueberry too. And peach. But only homemade. Store-bought doesn't tempt me at all! CHERRY PIE! Ten thumbs up, Karen. Gee, I've never had smoked fish. Maybe I should give it a try? My favorite meal is salmon cooked just about any way. I've never liked macaroni and cheese and think it's funny that so many people use it for comfort food. I love chocolate, especially dark chocolate, but I will not refuse milk chocolate. My doctor advised me a few months ago to start taking probiotics, so I've been doing that, experimenting with different brands and combinations of probiotics. I mentioned this to some friends. One of them gave me a large dark chocolate bar for my birthday - and it contained probiotics! Then she gave me several more for Easter. Between the pills and the chocolate bars, I'm doing okay, I think! I also love strawberries, blueberries, cherries, almost any kind of berry. For breakfast I've been making smoothies with various kinds of berries, kefir, yogurt, and ground flaxseed, among other things. Breakfast tastes so good now! Chocolate cake with chocolate icing -YUM! Now I'll go enjoy my breakfast smoothie! BACON. Yes, how could I forget bacon? ANd bluefish pate. Have hou ever tired it? Oh, my gosh. Fab. Blue cheese olives? Let me think about that. Love blue cheese. Love olives. But when I order a martini, I always ordered the olives on the side. Instant appetizer! Geez, I'm such a low-class person - a bag of potato chips. Just about any flavor. Pop that bag and bam! I'm there. Hearty chips with salsa. Homemade is best, Sam's Club (of all places) does a good one, but in a pinch any will do. Or melted Velveeta and salsa (I did say I was low class). Good cheese is always appreciated. Homemade cakes and pies I will definitely partake a bit (and I do a mean pie, just saying). Bread, absolutely. Definitely partial to homemade, but I've never been disappointed by anything bought from Oakmont Bakery, where it's practically homemade. It's the only place I'm allowed to buy a baked good. I don't drink much so you can keep the Prosecco and martinis. Not a big fan of olives, either. But a piece of good dark chocolate will also not go amiss. My brother-in-law brought dark chocolate non-pareils from a local chocolatier in Buffalo (Wahl's, I think). They were heavenly. That's the one, Hallie: John Cross Fisheries. There is always a line there, no matter when you go, at their little store which shares a parking lot with the harbor marina. Two other regional specialties are also fabulous (and could serve as successful seducers): parmesan-crusted whitefish, and cedar-planked salmon. Of course everything has a cherry theme there, too, since they have hundreds of square miles of cherry orchards up there. I can't tell you how many different dishes I've eaten there incorporated some kind of cherry sauce or whatever. And Michigan also has some stellar wineries, most notably out on the Old Mission Peninsula. Oooh, Karen, now I want to come to MI! Cherries, I love cherries, and yes I could be seduced by homemade cherry pie. But made with fresh cherries, not the gloopy ones from the can. And whitefish dip, and parmesa-crusted whitefish, and cedar planked salmon... I'm in. Just add the prosecco! I like my gin with lime or lemon and don't think martinis should be sullied by olives. Yuck. Although I do like blue cheese olives, but they are like eating balls of salt. But after reading all this what I really want to do is run away to Pappaduex, sit at the bar and eat fried oysters and cole slaw with a chilled glass of Sauvignon Blanc. Maybe if I take my laptop??? Oh, and how could I forget!!!!! My new favorite drink (thanks to Margaret M. who introduced me to it) - a glass of bubbly or even a nice sweetish but not too sweet Riesling with a splash of Creme de Mure. I call that a kir, Kaye - and I throw in some club soda so it will go further. Anathema to purists, I know. Key West, Charlevoix, MI, New Orleans...where else? Traverse City, National Cherry Festival. July 2-9, 2016. Key West! Or...someone from Michigan fly to my house...with a big big suitcase. It's funny, but when I started to think of foods that would reduce me to a gibbering idiot, I thought of several of my own dishes that I just don't fix much anymore, since it's usually just me here. There is a chicken noodle (wide noodles) casserole that makes me weak in the knees, as well as a spaghetti casserole. I'm a fan of casseroles. I used to make salmon patties quite a bit, too, and I love those with some mashed potatoes and my asparagus casserole (told you I like casseroles). To speak up for the sweet side of things, I used to make a chocolate cake completely from scratch called chocolate steam cake, and I would certainly include it in my list of seductive foods. There's a simpler chocolate cherry cake, too that can make me salivate. I think pretty much anything with cheese and potatoes could seduce me. I rarely eat fried foods, but fried oysters and fried chicken livers, both with breaded coating, are yummy. Oh, and crabcakes, especially from around Maryland, are an amazing treat. And, I have a guilty pleasure that is a hold-over from my college days when my husband, then boyfriend, and I were eating on the cheap. There was a little restaurant called Taco Tico in Lexinton, Kentucky, where we would eat an item called a sancho, basically seasoned beef and cheese in a soft flour wrap. There is still a Taco Tico in Lexington, and whenever I go there to visit my son, I have to have a sancho, no sauce. Oh, oh, oh, and the item that I have to have when I get to Louisville or points east in Kentucky is a Big Boy sandwich from Frisch's. Growing up in Maysville, Ky, Frisch's was one of our main eating places, and the Big Boy with an order of fries is just heaven to me. Karen, I'm sure you're familiar with Frisch's. On our way to Cincinnati when I was growing up (we were just an hour from there), we would stop around Newport, Ky at a Frisch's there. Oh, the wonderful connection of youth and favorite foods. Two more hometown connection foods. There was a little country-style grocery in Maysville that had been in business for over a hundred years, and they sold the BEST country ham on the planet. As an adult, I ordered ham from there about three times a year for different holidays, and plenty of it, at least 8 pounds at a time, sliced. Last year, my friend who owned it and was my age, died and there was much sadness at her passing. We would talk over an hour every time I called to order ham and catch up. And, nobody knew what would happen to the country ham business, as it was a family recipe and a coveted secret. Well, someone local did buy it and was given the recipe, but I haven't ordered any yet. I'm waiting to visit this summer and give it a try. The other item that Maysville natives cannot live without is transparent puddings from the local bakery. Even George Clooney and his wife visit there when they're in town and get transparent puddings. They aren't really puddings, more like little pies. You can get a pie, but the small pies in their little tins are just the bomb. Friends from Maysville have brought me this treat before, and I have brought them home to my family, where they don't last once they hit the table. Ah, good food, good thought. Kathy Reel - you're my kind of foodie. Really good ham is so hard to find. I went nuts over Ardennes ham from Belgium and Jamon Serrano from Spain. What you can get at the deli counters here in New England is pallid, PALLID I SAY! Lobster, Prosecco, a lovely aged Cabernet, good aged briny olives, anything marinated in vinegar (not with the wine though), spaghetti aglio et olio, pizza with basil and fresh tomato sauce (thin crust), cracked conch, fried chicken, fantastic cheeses on water crackers, fresh baguette with unsalted butter,and for breakfast, pain au chocolat. Always a place for dark chocolate, but other than that, give me savory every time. Did I mention Doritos tortilla chips, the first kind they made with the Mexican spices. I could eat bags, right now. Well, glad I waited until it was time for dinner to check this blog! Kathy: Oh, my goodness, yes. Frisch's. But back in the day. Sadly, not so much any more. I got a Big Boy a year or so ago, and honestly, I could have read a newspaper through the hamburger patty, it was so thin. Such a disappointment. The tartar sauce is still the best, though. We have a jar in the fridge, right this minute. I went to Busken's yesterday and bought a Maysville brownie for my husband and me to share. I don't what makes them so good, but they are insanely delicious. Karen, maybe the reason I've started ordering the Super Big Boy is due to the thin patties and I just didn't realize it. That tartar sauce is just the best. Glad you can get a Maysville brownie. Oh, Hank, how could I leave out bacon, too? There's nothing quite like a garden fresh tomato and some crisp bacon put into a BLT during the summer. Well, you could add a pressure cooker full of fresh green beans fixed with bacon grease and a tablespoon (or maybe a little less) of sugar. Hallie, we will have to share a meal. Does anyone have a good recipe for Babka ??? best lobster roll and clam roll on Cape Cod, in the mid 70's - can't recall where it was, I was just driving around on the north side and found a little stand OMG the Best !!! wrap in wet newspaper, then wrap very well in foil and put on hot coals and cover with them, cook an hour or so (I think, been years) OMG best fish I ever had, I could live on it.